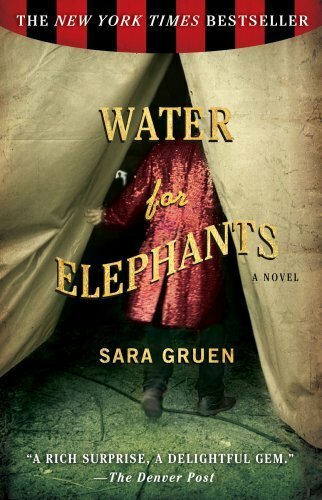 This week I finished reading the book “Water for Elephants” by Sarah Gruen. I feel like I am one of the last people to finally sink my teeth into this wonderful book — after all, it was a best seller back in 2007. I’ll admit, it was in my “to read” pile for too long. Why, you ask? Well, I guess I drug my feet because… really– who wants to read a book about the circus in the 1930’s?? Answer? YOU. This was a great book, yes set in the Depression Era 1930’s, yes about a traveling circus, but much, much more. I never thought I’d get engrossed in the workings of an old fashioned circus, the people, the performers, the workers, the veterinarian, the animals, and especially Rosie the elephant. There was deviousness, love, tension, death, and humor. I was not at all surprised to learn that Hollywood has already made a movie based on this book, which will be released in April of this year! I may never have read this, except for the encouragement of some of the folks at work who all highly recommended it. I’m sure glad they did – simply a great read. This entry was posted in Books 2011 and tagged books, water for elephants. Bookmark the permalink. Thanks for the recommendation Susan. This book was a delight. I loved every line……….couln’t put it down.